File under - products yummy enough to eat (though we advise you don’t). 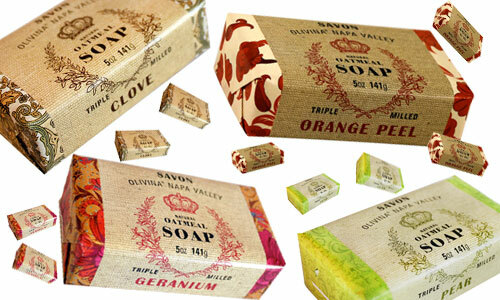 Olivina has a new line of soaps that happen to be the epitome of cozy. Each packaged in a cute sheet of printer paper. You’d think I’d be tired of printed paper goods at this point … never. Olivina is unique in that each one of their product lines has a clear shout out to an ingredient or pair of scents. In this case, the star contributor is oatmeal. Not to be confused with the oatmeal you eat with brown sugar and raisins, but Collodial Oatmeal that specializes in soothing itchy/dry/scratchy/irritated skin.